Perhaps you have one of them, a teen who is bright but just can’t seem to get things together. Sometimes I suspect most of us, parents and teens, are scattered in one way or another. But some struggle in a deeper way with executive skills, ‘the functions of our brains and thought processes that help us regulate our behavior, set goals and meet them, and balance demands and desires, wants, needs, and have-tos’. Those teens who struggle more than average need extra help to make a safe and happy transition to adulthood. In fact, many cases of ‘disobedience’ and ‘rebellion’ actually represent situations where teens do not have the skills to do what is required, whether it is resist peer pressure, assess risk, organize belongings, manage time, or whatever, and after a certain number of failures they give up. The promise and premise of Smart but Scattered Teens is that such skills can be taught and nurtured. 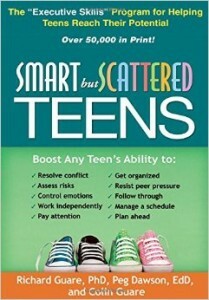 Smart but Scattered Teens is a guide for parents to understand what their struggling teens are dealing with and how to help them overcome these issues. Executive skill deficiencies make independence more difficult and more risky for teens, and because most teens are very much interested in independence they will be motivated to learn such skills…once they become aware that they lack them. However, this in itself requires a degree of maturity as well as an openness to adult help. The most helpful part of this book is breaking down the general scatteredness into 11 separate executive skills required to be a successful adult. It can be a great relief to realize that there are strengths as well as weaknesses, and that generalized feelings of inadequacy or concern can be narrowed down to just a few manageable areas, instead of expanding to an overwhelming feeling of total incompetence. What are these executive skills? (Note that the first five involve thinking skills, and the next six focus on behavior.) Each of these skills is outlined and explained, as is much background information. Then there are two tests to determine teens’ strengths and weaknesses, a self-test and a parent test. There is also a self-test for parents so that they will be aware of their own strengths and weaknesses as they work with their teens. A crucial point of this book, which bears repeating, is that even with motivation, scattered teens may not know how to do what needs to be done. Although it may look like disobedience, carelessness, or rebellion, it may be a simple lack of necessary skills. And skills can be taught. Thus the second half of the book is devoted to helping parents understand how teach and nurture these skills. Each skill is outlined and explained with stories and a table of questions; then practical suggestions are given and explained, focusing on school and driving issues. The goal is to take the single most pressing problem and focus on it first, and then to move on as needed. How do we do this without hovering over our teens, annoying and alienating them and wearing ourselves out? After all, if we damage the relationship, we have lost our ability to help our teens. The authors address this issue extensively, pointing out that the goal is to provide just enough support for our struggling teens to help them be successful. We also need to help them distinguish between tasks that are difficult (and that may require training) and those that are distasteful (and that just require motivation and consequences). If struggles have escalated to the point where the relationship is damaged, we may even need to find outside coaches to help our children. Above all, this book will help parents train their vulnerable teens in righteousness by providing them with skills that many other teens can pick up on their own. Proverbs, a Bible book written especially for young people, is full of wisdom about these areas and it goes further than Smart but Scattered, indicating that some executive skill deficiencies lead directly to sin. We need to train our children in the way they should go, and some will require more focused and explicit brain training to be able to act on the moral training. That is what this book is for. Will the material in Smart but Scattered Teens solve all of a scattered teen’s problems? Of course not. He or she will still be a sinner. And the brain is still growing and will take years of experience to mature. But the book will give scattered teens an arsenal of tools to deal with weaknesses as well as an encouraging understanding of personal strengths. It will help them fight some of the temptations that are unique to the weaknesses they have. Used wisely, it can also strengthen the parent-teen relationship. 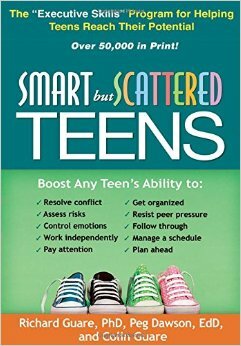 If your teen seems to struggle more than most with the mechanics of becoming a responsible adult, Smart but Scattered Teens may help. On a personal note, sometimes I, myself, feel overwhelmed by general feelings of ditziness. Taking the parent survey focused these feelings onto just a few areas of weakness. I now also understand better what is going on when I struggle to meet my responsibilities or am extra susceptible to sin; knowing what the issues are helps me to deal with them. I suspect that a struggling teen might feel the same way. Note that Smart but Scattered is not geared toward homeschoolers but its suggestions, ideas, and examples can easily be adapted. If you have a younger child who seems excessively scattered, the authors have earlier written a bestseller, Smart but Scattered, to help them. I have not read it but suspect it could be as useful as the book for teens. Concussions can lead to a loss of executive function. Here is a list of concussion supplements and practices that were prescribed for one of our children. This is yet another book in the in the 2016 52 Books in 52 Weeks Challenge and is also linked to Saturday Reviews, Booknificent Thursdays, Literacy Musings Monday, What to Read Wednesdays and The Book Nook. For more encouragement see Raising Homemakers, Titus 2 Tuesday, Tell it to Me Tuesday, and Finishing Strong. Disclosure: I borrowed this book from our library and, as usual, am not compensated for this review. Thank you for sharing this review, I have not heard of this book. Yet I do have a scattered teenager on my hands. Looking forward to finding this book at my own library! Thank you for your review. I am eager to read this book!